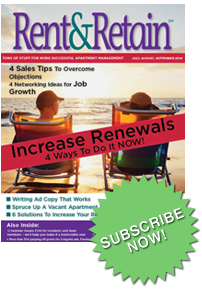 Reader Ideas — what other managers are doing successfully that you can easily emulate. 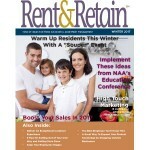 We’ll show you how to improve, expand and solidify your leasing and retention programs. 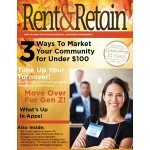 You’ll learn how to FIND and KEEP new residents. 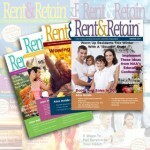 One year subscription: $79 for one year. Everything you get with a one-year subscription – with an additional year thrown in. Think about how much a lease is worth to you. If you lease one apartment at $800 per month, x 12 months = $9,600. 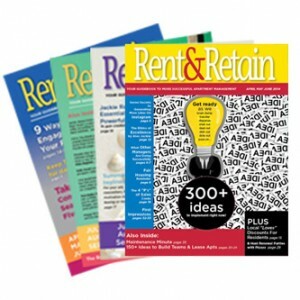 I absolutely guarantee you’ll rent an apartment with the ideas in Rent & Retain Magazine. In fact, you’ll likely rent a whole lot more than one. The investment, simply put, is totally worth it. Two years = $119 for two years. 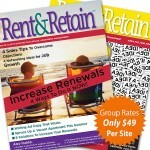 For Renewing Customers, Two years = $99 for two years. 2 year renewal = $99 (thanks for renewing!